We’d love your help. Let us know what’s wrong with this preview of Her Surprise Engagement by Ashlee Mallory. Soon-to-be Governor Jack Harrison has had a crazy week, but he Single mom Daisy Sorensen doesn’t believe in fairytale endings—at least not for her. All she wants is to enjoy a much-needed, stress-free family vacation at a friend’s Lake Tahoe home. So of course everything that can go wrong does. Including a gorgeous man and his daughter showing up in the middle of the night. To ask other readers questions about Her Surprise Engagement, please sign up. The Sorensen Family series has been a joy to read, each book has touched my heart and I've loved watching all the Sorensen's find their happily everafter. Each book can be read as a standalone and I highly recommend them all. Her Surprise Engagement now live! After her ex husband unexpectedly cancelled the trip to Disneyland for their children, Daisy Sorensen has to come up with something quickly that won’t cost a fortune. She takes up a friend’s offer to use her family’s holiday home on Lake Tahoe. Nothing goes as planned, especially when she discovers a single man and his daughter also thought they’d got use of the home for their holiday, too. It wouldn’t be so bad if he wasn’t so a Rating 4.5/5 stars! After her ex husband unexpectedly cancelled the trip to Disneyland for their children, Daisy Sorensen has to come up with something quickly that won’t cost a fortune. She takes up a friend’s offer to use her family’s holiday home on Lake Tahoe. Nothing goes as planned, especially when she discovers a single man and his daughter also thought they’d got use of the home for their holiday, too. It wouldn’t be so bad if he wasn’t so attractive and the chemistry between them volatile. She realises he’s also a prominent political figure – the soon to be Governor, Jack Harrison, and when the paparazzi also turn up life is definitely going along a different route. He suggests she pretends to be his fiancée but when the feelings between them prove to be anything but fake, can they make their relationship real? This is a different take on a contemporary romance and a lovely story to escape into. The characters are complex and brought to life within the pages of the book. The story is well paced and has plenty of other surprises along the way to make it a brilliant, highly entertaining read that I have no hesitation in highly recommending. I’d really like to know if Payton and Emily were planning to be matchmakers all along . . . . if so, it worked! In Her Surprise Engagement we focus on the last of the Sorensen siblings, Daisy. Daisy has recently become a single mother and she’s determined to prove that she can provide for her I received a copy of this title via NetGalley. It does not impact my review. Daisy Sorensen is a single-mom of three kids. For the past two years, she has been pretty much taking care of the kids alone, since her ex-husband only likes to acknowledge he has kids when it’s convenient for him. Daisy is headstrong, stubborn, full of pride, and doesn’t like to ta Ashlee Mallory returns readers to Salt Lake City, Utah and the lovable, close-knit family of the Sorsensens. In the final installment of the series, oldest Sorensen sibling, Daisy finally gets her happily-ever-after. Daisy Sorensen is a single-mom of three kids. For the past two years, she has been pretty much taking care of the kids alone, since her ex-husband only likes to acknowledge he has kids when it’s convenient for him. Daisy is headstrong, stubborn, full of pride, and doesn’t like to take handouts. While her family has often offered to help her, she consistently refuses. For months, Daisy’s ex has been promising to take the kids to Disneyland, only to cancel on them at the last minute to go on a vacation with his current girlfriend. Not wanting to disappoint her kids and at the insistence of her sister-in-law, she takes them to Lake Tahoe and the family cabin of the Vaughns. Jack Harrison is a single father to a 13-year-old daughter. He’s currently the Lieutenant Governor of Utah. He’s just found out that the current Governor is taking a different position and he’s about to become the new Governor. Wanting to take a quick vacation with his daughter before the news breaks, he accepts the offer of Mrs. Vaughn to head to the Vaughn cabin. Daisy and Jack are both surprised to learn that the other is at the cabin. They become even more surprised and shocked to discover reporters have learned of the government change and show up at the cabin. Things get a little out of hand. In order to save his reputation, Jack makes a business arrangement with Daisy. If she pretends to be his fiancée, he will help her secure funding to open her own bakery. Things get blurred when lines are crossed and a fake engagement turns into real feelings. Her Surprised Engagement was the story that I’ve been waiting on. I’m not crazy about the setup. This is a standalone read, but honestly, what are the odds that four siblings will all find their happily-ever-after from what started as fake relationships? As characters, I liked both Daisy and Jack. And the kids definitely added to the story. While on this week vacation, they all actually became a family. I loved that the kids played a role in bringing them together in the end. Truly one of the best romance books I've read lately. Loved how both Daisy and Jack worked through their past hurts to find that love is enough. That due to past hurts you can be blind to the motivation of loved ones. This is a wonderful book that I highly recommend. I received this book in exchange for my honest review. I hope you enjoy the heart warming story of Jack and Daisy. Daisy, single Mom with 3 kids, stubborn as they come, refuses to ask for help and badly burned by her ex. The story opens with them piled in a tow truck headed to Paytons family's summer house on Lake Tahoe with Aunt Glenda in tow as well. Oh and it's pouring ra Daisy Sorenson gives the word stubborn a new meaning. Daisy and Jack, a winning combination!! There's a little something for everyone in this book and if you've been reading the series you get to catch up with the rest of the Sorensons. Daisy, single Mom with 3 kids, stubborn as they come, refuses to ask for help and badly burned by her ex. The story opens with them piled in a tow truck headed to Paytons family's summer house on Lake Tahoe with Aunt Glenda in tow as well. Oh and it's pouring rain. The kids are cute as heck, each with their own personality and they shine right through the pages. Confusion reigns supreme when after getting the kids settled,Daisy soaks in the tub and donning her snug fuzzy robe and ill matching fuzzy socks grabs a glass of wine and goes out to sit on the deck, when coming back in there's a man, a very good looking man standing in the kitchen. Daisy drops her glass, not wanting to scream to wake up the kids and this man looks suspiciously like the LT Governor of Utah. Because he is. He's brought his young daughter Lily, along with their pup Oliver ( cuteness overload). He'd called Paytons mother to ask about staying there, their families are long time friends, and here they are. The daughter Lily is still pouting about having to be there, Jack is facing being slotted into the Governors position because the Gov. has taken a Cabinet appt. and everyone is scrambling. Jack just wants time with Lily before all this hits the media. He's a widower. Daisy and Jack decide to get some sleep and make decisions in the morning. puts on this whole family scene is they're engaged. With that Jack will help Daisy with her bank papers to get a loan to open her own bakery. Daisy doesn't like asking or taking and she's the most determined person on the planet. Jack oversteps a few times and Daisy sets him straight but it's lovely to see these two slowly fall for each other, despite all Daisy's fears. The story continues on after they arrive back home, there are some twists and turns. Benny is getting married to Henry so that's coming up soon. Jack promises to teach Paul how to tie his bowtie because his Dad said he would and never did. Jack is just struck at what a jerk her ex is. Her promises Paul he will teach him or be there on the day of the wedding to tie it for him. Well since one shoe already dropped when the second one did, I wasn't sure which way things were going to go. The emotion level was all over the place and a couple times a wanted to whack them both. This was a great ending to the series, I loved the book, loved it. Great story, the characters were perfection, right down to the children. I loved the dog. It's a great read. Best book of the series! Single mom, Daisy, still struggling with her divorce and financial troubles from her prior marriage wants nothing but a stress-free family vacation at her sister in law’s vacation home. This is thrown for a loop when widowed, soon-to-be Governor Jack arrives with his daughter in tow. Thinking he has booked the vacati When I find myself in reading slump, I always find myself drawn to a good ol’ fashioned romance. Her Surprise Engagement by Ashlee Mallory was just what I needed to lighten my load. Single mom, Daisy, still struggling with her divorce and financial troubles from her prior marriage wants nothing but a stress-free family vacation at her sister in law’s vacation home. This is thrown for a loop when widowed, soon-to-be Governor Jack arrives with his daughter in tow. Thinking he has booked the vacation home, there is nothing much to do but wait for the morning and deal with the mix-up. However, when the paparazzi arrives, having followed Jack, things take on a life of their own and before she knows it, Daisy finds herself in an arrangement she cannot refuse. She will pretend to be engaged to Jack and he’ll help her open the bakery she has been dreaming of. What starts as a business agreement, soon becomes tricky, as the pair develop feelings for each other. This is technically the fourth in this series by Ashlee Mallory; I hadn’t read any of the prior books but I had no trouble settling into the plot and could follow it quite easily. I am a sucker for a fake relationship storyline in the movies I watch and the romance I read; I love the humorous spins and the mix-ups. This one fit that mould perfectly. Humorous and heart warming, I finished this one easily in a sitting. I loved Mallory’s easy writing style and the relationships between the characters. When I heard about this book I knew I had to read it. I'd just gotten back from a trip to California and had stopped by Lake Tahoe to show my kids how beautiful and magical it was. So when I saw it was a romance set at Tahoe I was totally hooked. I related to this book on so many levels. First of all, the characters are from Utah which is where I live, and next, it's about a single mom with three kids. Until recently I was a single mom with four kids. I found this great guy who swept me off my f When I heard about this book I knew I had to read it. I'd just gotten back from a trip to California and had stopped by Lake Tahoe to show my kids how beautiful and magical it was. So when I saw it was a romance set at Tahoe I was totally hooked. I related to this book on so many levels. First of all, the characters are from Utah which is where I live, and next, it's about a single mom with three kids. Until recently I was a single mom with four kids. I found this great guy who swept me off my feet and helped me out just like in the book. Swoon. Jack Hamilton was such an amazing character. Handsome, successful, kind-hearted, generous, and the future governor of Utah? That was just SUPER hot. He was the perfect Prince Charming and she was his Cinderella. Daisy was a strong, independent woman, who'd lost everything because of a cheating, loser ex. I couldn't help but feel for her. I totally related to the guilt she felt for marrying him in the first place. So it made sense that she was so hesitant to jump into a relationship with Jack despite the chemistry and the feeling of it just being right. I felt a little frustrated that Daisy wasn't more accepting of his generosity in the book, but as I read further I understood the flaws of each character and why they made the choices that caused them to experience some bumps in their relationship. It was beautiful to read about their growth and their realization of how they needed to change. The kids are older. The parents are somewhat wiser and emotions run deeper. Her Surprise Engagement is about starting over when happily ever after doesn't work out as planned. The kids are precocious and the romance borders more on sweet than heat, but Ashlee Mallory uses that to her advantage. Not only do Daisy and Jack gain a second chance at love, but along the way they learn the true meaning of family. Daisy Sorensen has had to be strong to cope with her husband divorcing her for a much younger woman and leaving her with three young children, little money, no credit rating and a desire to never be dependent on anyone again. Daisy is a creative baker and dreams of opening her own bakery but obtaining a loan without assets and a good credit rating is almost impossible but accepting help from friends and family is something she's not prepared to do (she's stubborn to a Lovely and Engaging Romance. Daisy Sorensen has had to be strong to cope with her husband divorcing her for a much younger woman and leaving her with three young children, little money, no credit rating and a desire to never be dependent on anyone again. Daisy is a creative baker and dreams of opening her own bakery but obtaining a loan without assets and a good credit rating is almost impossible but accepting help from friends and family is something she's not prepared to do (she's stubborn to a fault). When a booking mixup finds her sharing a vacation house with Jack Harrison, a widower and the prospective new Governor of her State, along with his teenage daughter and the Press finds out about, all hell breaks loose. Jack's solution is a fake engagement - he won't look bad in the Press, their kids will be protected and he will co-sign her loan application in exchange for 5% of the profits. Jack quickly realizes that he wants the engagement to be real and because he loves her wants to smooth her path in life and remove some of the stress she is under. Daisy is harder to convince, particularly when he ignores her wishes about being independent. A lovely family romance with a HEA. Two families, one vacation house, a mix up in communication on the availability of that house and one politically damaging situation equals the need for some fast thinking and a possible solution for two strangers. Daisy just wanted to get her three kids and her aunt to the vacation her sister-in-law had offered them at Lake Tahoe. A poor substitute for Disneyland, but then it’s just one more time that their father, her ex, had let them all down for his own selfish reasons. Her van dying on the way hadn’t helped matters any. Now all she wants is a soak in a tub and a bed to fall into. Jack was thankful that a friend of the family had offered her family’s vacation home for his and his daughter’s use over the coming holiday week. As Lieutenant Governor, Jack was certainly used to politics, and now it seemed that he might have that shot at Governor sooner than next election if things worked out. But this was his time with Lily, a chance to ease her into understanding what was coming next for them. He expected an empty house. What he found was an opened wine bottle on the kitchen counter, and a lovely sleepy woman in a very old bathrobe instead. Add into that mix a reporter and camera crew at the front door and some innocent children’s comments – and you have a political mess to clean up, fast. Her Surprise Engagement starts off with a chuckle, a bit of attraction and two adorable families…. oh, and a fake engagement. I had fun with this story. Daisy is still recovering emotionally from her ex-husband’s actions. She’s strong, stubborn and unlikely to accept help from anyone. So when Jack proposes a business deal in exchange to pretending to be engaged for a short time she reluctantly gives in. And over the course of a few days two families seem to slowly merge into one group. It would be easy to think that this can be forever. But Daisy knows full well that fairy tales are a pretty story and nothing more. Jack’s need to help and Daisy’s determination to not accept help are at the center of their troubles. The issues they faced, the pressure and the feeling of belonging that they bring out makes this an emotional romance where you will be fully engaged in the outcome for this couple. I would definitely recommend this story, and the entire series to any Romance reader who enjoys strong stories, believable couples and interesting secondary characters. Although this is the 4th book within the Sorensen Family series is the first one I've read (so far). I own book 1 and plan to go back to read it as well as the other books within the series to find out the little hidden details in each book as the story progresses. Her Surprise Engagement was a great story of putting your heart on the line a second time after it being crushed, one way or another. You just have more to think about and hope for the best outcome, or stay the course of going it alone. Which will Daisy and Jack do? You'll have to read the story to find out! I voluntarily reviewed an ARC copy of this book via IndieSagePR through NetGalley for an honest blog tour review. • “If it’s one thing I know about you, Daisy Sorensen, you will take that step one way or another. You’re not going to let your kids see you give up. Whether it’s now or in twenty minutes or in one hour. Because you don’t walk away from a challenge. You’re a fighter and no matter what obstacles have been put in your way, you’ve pushed past them to be the amazing mom and woman you are. • You’re already invested. So rather than worrying about what could go wrong, focus on seeing what wonderful things are possible. Her Surprise Engagement is a sweet (with just a little heat - nothing explicit) fake engagement romance between two single parents. This is a fairly light-hearted read with just enough tension underlying throughout the book to keep things on edge and make you eager to find out how things play out. While this is book 4 in the series, it can be read as a standalone (I personally have only read b A sweet (with just a little heat - nothing explicit) fake engagement romance between two single parents. Her Surprise Engagement is a sweet (with just a little heat - nothing explicit) fake engagement romance between two single parents. This is a fairly light-hearted read with just enough tension underlying throughout the book to keep things on edge and make you eager to find out how things play out. While this is book 4 in the series, it can be read as a standalone (I personally have only read book 3 before this one). Told from dual points of view, Daisy and Jack have a great chemistry that is steadily built up in an intriguing way that fits in perfectly with the theme of the book. Daisy and Jack are in complete opposite positions with him standing for governor and from a wealthy family and her as a struggling but determinedly independent single mom who is doing her best to achieve her dreams while doing the best for her kids. Things do heat up between the couple but never overtakes their relationship, or the book, just adds support to their attraction and budding relationship (and without being explicit). I loved the role their kids play in the book where they are not forgotten about and are included in the development of both Daisy and Jack’s characters. If you enjoy a well written fake or single parent romance but without too much spice, definitely give this sweet book a read! Loved this book! It's sweet and fun with lovable characters. Dixie is a single mom of three that was badly hurt by her ex-husband when he abruptly left her for a woman half his age. Dixie suddenly found herself without an education or skills and needing to support her children without dependable help from her ex-husband. So, she dug deep and started working hard to make it on her own - in the process developing a strong sense of pride and self sufficiency. However, she accepts use of a Tahoe vac Loved this book! It's sweet and fun with lovable characters. Dixie is a single mom of three that was badly hurt by her ex-husband when he abruptly left her for a woman half his age. Dixie suddenly found herself without an education or skills and needing to support her children without dependable help from her ex-husband. So, she dug deep and started working hard to make it on her own - in the process developing a strong sense of pride and self sufficiency. However, she accepts use of a Tahoe vacation house from her sister-in-law. Jack is an attractive and wealthy single father whose wife died years ago. He still loves her and hasn't had a real relationship since her death. He's just learned that he is soon to become the next governor and decides to take a week with his daughter at the family's vacation home in Tahoe. With both of them vacationing in the same house, unbeknownst to each other, the stage is set for a delightful romance with some humor tucked in. This is a feel good romance that made me smile. I particularly liked how independent Dixie was and how she wasn't looking for a man to take care of her. Fans of the genre will want to read this one. I've added the author to my must read authors' list. I have been waiting for Daisy to get her happy ever after since she first appeared in the first book in this series, Her Backup Boyfriend. And I have to say that Jack was perfect for her. Daisy is fiercely independent and wants to be successful on her own. She refuses help from others and sees it as pity. You have to admire a strong woman like that. One who is trying to take care of herself and be the example for her kids. She was such a remarkable character for me. I loved her and her strength. I have been waiting for Daisy to get her happy ever after since she first appeared in the first book in this series, Her Backup Boyfriend. And I have to say that Jack was perfect for her. Daisy is fiercely independent and wants to be successful on her own. She refuses help from others and sees it as pity. You have to admire a strong woman like that. One who is trying to take care of herself and be the example for her kids. She was such a remarkable character for me. I loved her and her strength. Then there is Jack, who is utter perfection. He has a huge heart and wants to do right by his own daughter. He and Daisy had a sweet connection right from the start. And Jack had some of the best lines I have ever heard in a book. He was charming and so sincere. I absolutely loved him. And the scenes he was in with all the kids - major swooning. This book was beautiful and makes me want to have more of these characters and their families. It was great having Daisy's family as a big part of the story and get a little caught up with them too. Her Surprise Engagement by Ashlee Mallory is the fourth book in the Sorensen Family series. I haven't read any of the previous books so I read this addition as a standalone without any problems. I really enjoyed the story and would give it 4.8 stars. Daisy Sorensen is looking forward to a mini vacation with her three children in her sister-in-law Peyton's home at Lake Tahoe. But on their way there her mini van breaks down and luckily the tow truck gives them a ride to the house. Daisy wants to enjoy her time off work and fill out her Small business loan application so that hopefully soon she will be able to open her own bakery/catering business. Little does she know that Soon-to-be-Governor Jack Harrison and his daughter Lily have been promised the house as well. Will Daisy and Jack be able to share the house and when the media find them will she be able to pass herself off as his fake fiancee? Can she accept help from Jack after her ex-husband ruined their credit and lives when he left? Jake Harrison will be soon Utah's new governor when the present one decides to accept a posting in new President's cabinet. He's a widower with a 13-year-old daughter who lives and breathes her phone, they decide to relax at the lake side house before his campaign to win the governor's seat. But little did he know that he'd soon fall in love with a head strong woman and her three kids. They say it takes a village to raise a child but in Daisy and Jack's case it will take both of their families to work out everything and become the family both of them want. Her Surprise Engagement could work as a standalone, if A sweet fake-to-not romance story! Daisy Sorensen is a single mom working hard to raise her kids and do something more than work for someone else. Jack Harrison is a widower raising his teen daughter on his own and soon to be named the next governor. Both are looking for a little down time and decide to take advantage of the mountain cabin their friends have offered. Much to their surprise they end up at the cabin at the same time. Loved this one!! These characters were so good you couldn't help but get involved with each of them. Daisy Sorensen is a single mom working hard to raise her kids and do something more than work for someone else. Jack Harrison is a widower raising his teen daughter on his own and soon to be named the next governor. Both are looking for a little down time and decide to take advantage of the mountain cabin their friends have offered. Much to their surprise they end up at the cabin at the same time. The mistake would have been cleared up the next day except the press is camped outside their door by then! How does the man soon to be governor explain staying at a cabin with the single mom?? Make up a fake engagement of course! The other one is Daisy Sorensen , a single mom of three adorable kids. Daisy and Jack end up accidentally sharing the same vacation home. Between the public image, the make believe engagement , a rambunctious dog, and 4 kids , the story is not only entertaining I absolutely loved this book and Ms Mallory , a new author for me, has a new fan. Between the public image, the make believe engagement , a rambunctious dog, and 4 kids , the story is not only entertaining , but also very touching . From the moment they meet , sparks fly between Jack and Daisy. Both are cautious but life is full of surprises. Jack and Daisy are strong , likable characters. I loved that the author highlights the importance of family and how both seemed determined to be there for their kids. While Jack still feels guilty for not having been there for his dying wife, Daisy, is determined to be a strong independent woman, especially after her ex left her penniless with three kids . A story that will make you laugh, cry, and at times, want to shake the characters . But in the end , support, respect and love overcomes all obstacles. Thank you , Ms Mallory, for such a wonderful story. I was gifted this copy by Netgalley. The opinions expressed are solely my own. Daisy, a divorced single mom of three, is on the way to Lake Tahoe, thanks to her new sister-in-law, Payton's, generous offer, with her kids and Aunt Glenda. Jenna, Natalie, and Paul were supposed to go to Disneyland with their father, Daisy's ex-husband, and had been looking forward to it for months. However, he decided taking a vacation with his new girlfriend was more important. Jack, a widowed single father, decided a road trip, with his daughter and their five-month-old Lab, Oliver, in his classic car no less, to their spur of the moment summer vacation destination would be fun. But upon realizing the current governor was accepting a different position, and Jack, as the lieutenant governor, will take over the role, meaning he and Lily's lives will change yet again, including heavier restrictions on Lily for safety reasons, he knows they need to get away from it all beforehand. Thankfully, the Vaughns, family friends along with their daughter, Payton, offered their vacation home in Lake Tahoe. Neither Jack nor Daisy were expecting to confront a stranger in their temporary home. Hey wait, she knows who he is, well, everyone does due to his political position. As for Daisy, she also attended, and admittedly spent some of that time fantasizing about him, a seminar he'd spoken at regarding starting a small business. Jack can't help but notice how beautiful Daisy is, nor the loan application she's filling out, as well as the obvious "tight" financial spot she's in. Due to the late hour, Jack and Daisy agree to figure everything out in the morning. Jack knows his new position is precarious, especially as he'll begin campaigning almost immediately to retain it, so he can't risk anything that could be construed as scandalous to voters, especially since they live in a conservative state, regardless of how innocent it is. Daisy wants to start her own bakery, but first she needs the dough to sell her dough. *Yeah, it was cheesy, but I love word play. LOL* She has no time for anything except her kids and creating a new life for them. Jack knows it's best, and easier, for he and Lily to find other accommodations, but admits his disappointment in walking away. As their separate family vacations become a joint getaway, both Jack and Daisy recognize how right it feels to spend time together, and that the instant attraction they felt upon first meeting has only strengthened it. But the connection building between them is even more intense and both must decide if it's worth exploring. Can Jack and Daisy let go of their pasts and look toward a future together? Can Daisy handle everything being with the governor will entail? Will these two learn to compromise as needed? Is there a HEA for these families together? Or will they go their own separate ways, always wondering what could've been? One-click now and follow along as a double-booking starts a journey toward forever. Also, on a side note, Jenna started off at ten, then a few pages later it states she is "more mature than warranted for her near twelve years. ", and then yet again approximately 80% in Jenna herself says that she's eleven. Some consistency on that would've been nice. Daisy Sorensen was looking forward to the few days she was spending at Lake Tahoe with her three children and her aunt until Jack Harrison rocks up at the holiday house they're staying at and turns her life upside down. Being the soon-to-be Governor comes with a certain level of invasion to privacy moments, and when the paparazzi arrives believing they could have a possible juicy story on their hands, it seems Daisy has no choice but to go along with Jack's plan of changing their relationship status from single to engaged. However, the closer they get, the more Jack wants their 'fake' engagement to be the real deal. Will he be able to convince Daisy to give him a chance for real, or will the hurts of her past keep her from giving another man a chance at forever? Having not read the previous books of this series, I was a tad concerned whether I could read this without needing to know more about the Sorensen family, but I'm glad to say this story can easily be read as a stand-alone. The way this story started had me feeling sorry for the heroine, as her life is pretty hectic with three children and her ex being a jerk that is more concerned about what's happening in his own life than spending time with his children. Yet, it was from the moment the hero was introduced to the heroine where things got interesting, as they're both in for a surprise. How will they deal with the mix-up? Will Jack be able to protect Daisy and her children? Both the main characters were fascinating due to their back stories and the reason why they need to become fake engaged. Will they be able to convince everyone that they're in love? As for the heroine, she isn't ready for another relationship, because of what her ex did and the fact that it has made it hard for her to trust, but I liked that she gave Jack a chance to protect her children. I also liked how resilient and brave Daisy was in starting over and how determined she was to follow her dreams, especially when it becomes more likely to happen with Jack on her side. But what I liked most of all is how kind and caring Daisy is and how she treats Jack's daughter as if she was her own, even when the young girl isn't all that open to getting to know Daisy and her children in the beginning. While the hero, he's been through a lot and deserves a second chance at love. Moreover, I couldn't help but sympathize with how he lost his wife and the guilt he feels because he should have been there more for the woman he loved. Yet, what I liked most about the hero is how driven he is in everything he is determined to achieve or has already achieved. The heroine is coming to mean so much to him, and I really enjoyed his words and actions in his determination to win her over and prove to Daisy that he's different to her ex. That there's no way he'd let her down, even though he continues to go against her wishes when it comes to her need for independence and not having to rely on someone other than herself. This was cute, I will give it that. And was it a sweet, fun, light story that a lot of others would enjoy? Sure. It was all of those things. And I do have to say, I did love Daisy's independence and her refusal to be just dependent on Jack. But between all the characters, and the faking the engagement, and the paparazzi to the dog to the kids, I just felt a little overwhelmed. And perhaps the speed with which they fell into their relationship and its whirlwind nature - both the fake and the 'real' one, soured my opinion of it a little. It's always great to see an independent single mum, and to see Daisy refusing to rely only on Jack, and accepting all his several lavish gifts was nice to see - but it was also nice to see the nuance in her character that she didn't always refuse to do so - willing to accept help. I also loved her ability to dream to do more and to be more, setting up her own business (albeit with a little help from Jack - but then again, we all need help sometimes). Jack, on the other hand, as lovely and sweet and cute as he was, I just didn't love his character as much as I enjoyed reading Daisy's story. Jack was nice, and serving his people as a politician, and that's all very well and good, but he didn't make me swoon, which I suppose is what all of us want out of a romance novel. I did like that he cared so deeply for his kid and for Daisy - that was really lovely to see, but I suppose that's just it - he was just nice. Just nice. And I would have loved to see some deeper fire, about what really drives him, conveyed more. As far as fake engagements/relationships go, it's pretty by the book. And I do love those storylines, it's one of my favourites actually. The transition and confusion between what's real and what's fake, is always so fun to read about, and I love tagging along for the ride. So, in that respect, it was really lovely to read. Note: I was very generously given an ARC of this novel by the publisher and the author via NetGalley in exchange for an honest review. All thoughts and opinions expressed are my own. I typically prefer books that offer a little spice along with a well conceived romance. However, since the Bliss imprint from Entangled always offers a great story, I tend to overlook my need for more. 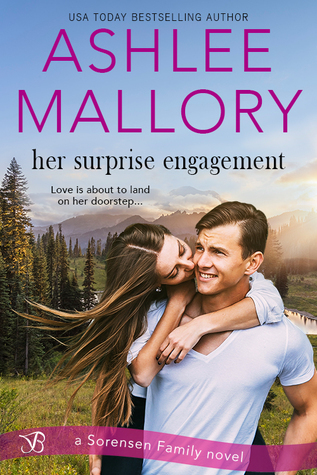 Her Surprise Engagement by Ashlee Mallory, is a wonderful book, with well-developed characters and a plot that kept me engaged from start to finish. This is the fourth book from The Sorensen Family series, and it can be enjoyed as a standalone. Daisy Sorensen is slowly getting her life to 4.5 Stars! Daisy Sorensen is slowly getting her life together after her divorce from two years ago. Her ex-husband Leo continues to have very little interest in their three children, which leaves Daisy to parent alone and support her family. Daisy is a talented baker, and hopes to open her own bakery in the very near future. Unfortunately, her new and inflexible boss stifles Daisy's creativity, which has turned the job that Daisy once loved, into one that she now detests. After her ex cancels the kid's vacation to Disney at the very last minute, Daisy scrambles to find a reasonably priced vacation spot. Luckily, she is able to take her family to her sister-in-law's beach house, which happens to be unoccupied for the week. Jack Harrison is smart, good-looking and wealthy. He is also the next governor of Utah, if all the votes and logistics fall into place. He lost his beloved wife to cancer a while back and he finds raising his thirteen-year-old daughter to be quite challenging. Before the campaign becomes his life, he takes his daughter on vacation. Jack is surprised to find Daisy and her brood already vacationing at the beach house an old family friend assured him was free. Nevertheless, the huge home can accommodate them all and over a very short period of time, they all get along famously. When the press finds out that Jack is shacking up with a woman and her family, Jack and his publicist quickly come up with a story that will help Jack save face and hopefully help him win the governorship. To the world, Jack and Daisy are now engaged and looking forward to wonderful life together. In exchange for Daisy's cooperation, Jack agrees to cosign her business loan. Overtime, Daisy and Jack fall in love, and together with their kids form a family. They have a few obstacles to overcome before they can be each other's forever, and Ms. Mallory does a terrific job creating the conflicts that arise. Overall, this is an entertaining romance that I enjoyed very much. Loved Jack. At times he was coming off strong but I think it’s because he is so comfortable with himself and his feelings that he owns them and doesn’t apologize for it. He also has a desire to take care of those he loves. It is hard for him not to want to help Daisy when he can. Jack is kind, caring and sweet. I loved him with Daisy’s children and how he included them and his own daughter in everything he did. He didn’t pass them off to someone but want Received in exchange for a honest review. Loved Jack. At times he was coming off strong but I think it’s because he is so comfortable with himself and his feelings that he owns them and doesn’t apologize for it. He also has a desire to take care of those he loves. It is hard for him not to want to help Daisy when he can. Jack is kind, caring and sweet. I loved him with Daisy’s children and how he included them and his own daughter in everything he did. He didn’t pass them off to someone but want the to be a part of things. He was a great dad and an amazing person. So loyal and honest. He harbored some guilt but was learning to move on. Daisy was struggling. Her ex was a true douchecanoe and she was really trying to keep things afloat while giving her children a sense of safety and love. So when she starts to feel on her feet and steady she doesn’t want any help from anyone. She is too afraid of losing herself to another. So afraid that she almost loses a wonderful romance because of it. Her fears dictated things and so did her stubbornness at times. She was a good character just afraid. Her and Jack meet when a mixup occurs and they are both at the same time in the cabin of a family member. Only for Jack he didn’t see a problem only a solution. He was a fixer. He was attracted to Daisy as well. You could feel the chemistry between them. Jack though was in politics and it did have them in a precarious situation. The solution was a pretend engagement and this gave us such fun family moments. We see them shine when they are with their children. We also see them support and understand one another. We see them explore getting to know one another and their attraction. They feel safe with each other and confide in one another. Only things do escalate and Daisy does feel overwhelmed on things. But this doesn’t deter Jack. When they get home, he is overenthusiastic on some things and Daisy doesn’t take it well. It breaks my heart when that happens because Jack is a good guy. Just a fixer. I love how in the end though he makes Daisy’s son day by keeping his promise. And Daisy finally realizes she won’t lose herself if she lets someone in to share her worries, burdens, fears and gets support from them in every way. One thing I have to note is that the book cover doesn't seem to fit Daisy and Jack. Oh it is attractive but it doesn't go with their characters for me. My perception of Daisy was different from how she is I had just finished Her Backup Boyfriend when I came across the opportunity to review Her Surprise Engagement. So I of course jumped on the chance because I was intrigued by Daisy's character. She showed strength in it but I was in two minds about her. So I am happy the way her story turned out. My perception of Daisy was different from how she is in this book. I love her strength, her stubbornness and her love for her family and friends. She is well developed and is a good complement to Jack. Her love is boundless as shown by willingness to include Jack and his daughter in her inner circle. Oh how I loved her character! Another surprising character who caught my heart in their trap is the hero himself. I have read books with heroes who are billionaires, teachers, firefighters, players etc., But I have never encountered a politician as a hero and I was pleasantly surprised how down to earth he was. I loved his simple needs and his yearning for a big loving family. Kudos to the author who once again has created a protagonist pair who touched my heart effortlessly with their actions and their pasts. The way the author added a bit of sadness of their pasts to enhance their present happiness adds well to the story. The romance was sweet but not over the top. It was perfectly paced and I loved their love story! Oh I wish this happens in real life!! Now I am smitten with the Sorenson family and I can't wait to read the other intervening books. Each is a standalone so it doesn't have to be read in order or all books have to be read. You can always enjoy it as a single. Now I am off to peek at the other titles while I hope you guys check this one out!! I strongly recommend this tale and the series to people who love romances with sweet love and family closeness. Ashlee Mallory produces another sweet and engaging Sorensen Family romance with a fiery Heroine and a dashing Hero. Daisy's a single mother of three children suffering from a deadbeat husband and dead-end job. She's independent and hates asking for help. However she asks her sister-in-law, to loan her the use of her family's vacation house. Coincidentally, Jack asks Mrs. Vaughn permission to use her vacation house as well. He's assured it's free for his and his daughter's quiet vacation. Jack's Ashlee Mallory produces another sweet and engaging Sorensen Family romance with a fiery Heroine and a dashing Hero. Daisy's a single mother of three children suffering from a deadbeat husband and dead-end job. She's independent and hates asking for help. However she asks her sister-in-law, to loan her the use of her family's vacation house. Coincidentally, Jack asks Mrs. Vaughn permission to use her vacation house as well. He's assured it's free for his and his daughter's quiet vacation. Jack's about to leap-frog from lieutenant-governor to governor. The current governor's waiting for approval for the cabinet position the President has appointed for him. Trouble begins the morning after the families arrive at the vacation house. Reporters come looking for the young widowed lieutenant-governor and his daughter but find a woman in her robe. This causes a potential scandal and there's only one simple and mutually beneficial solution. A surprise engagement. Ashlee Mallory creates so many likable children characters; that's pretty hard to do. The family vacation fun scenes are amusing and heartwarming. Romantic scenes between Daisy and Jack are almost platonic but there's a heat and chemistry that's palpable. Jack's enthusiasm for his attraction to Daisy's endearing and the story of his late wife's illness and death is heartbreaking. Daisy's ex-husband shows up briefly and allows Jack to show off an ability to be an understated Alpha. Very classy. Daisy's self-reliance may have gotten more stringent due to her ex-husband's unreliability but it may have existed all along. In "Her Surprise Engagement" Jack's a wonderful hero who's loyal, giving (to a fault), and passionate. I love how he's almost as dedicated to Daisy's kids as he is to her. All of the Sorenson Family and their love interests are in attendance. Unfortunately there's no brother-suitor bloodshed this time. WOW!!!! I LOVED this book! I started reading it and was hooked from the very start and could not put it down. Her Surprise Engagement is the 4th book in the Sorensen Family Series, but it was able to be read as a standalone. This was the first book that I read in the series and I could tell that if I had read the other books before hand, I would have loved these characters even more than I already did. This book gives Daisy a turn at her own story since her siblings have all gotten one of their WOW!!!! I LOVED this book! I started reading it and was hooked from the very start and could not put it down. Her Surprise Engagement is the 4th book in the Sorensen Family Series, but it was able to be read as a standalone. This was the first book that I read in the series and I could tell that if I had read the other books before hand, I would have loved these characters even more than I already did. This book gives Daisy a turn at her own story since her siblings have all gotten one of their own. While getting away with her kids for a week during summer vacation, Daisy's world is turned upside down when the house she is staying at is accidentally double booked and she ends up face to face with soon-to-be Governor Jack Harrison. He is extremely handsome, thoughtful and an amazing father. The problem is that word gets out about the two of them sharing the house and Jack can't risk the negative stories the press is starting to run with. In order to help him out, Daisy agrees to pose as his fiance until the media circus dies down. However, things get complicated when real feelings start to develop. Daisy and Jack are from two different worlds, and Daisy has been hurt before and has promised herself that it won't happen again. Can Jack help tear down the walls she has worked so hard to put up, and can Daisy finally start to let someone get close enough to her to let those walls down? With 4 kids involved as well, it's not sure the two of them that they need to think about. I was going through so many emotions while reading this book and on the edge of my seat during a few moments. I loved the chemistry between Daisy and Jack and was so sad when the book came to an end because I was not ready to be done hearing their story.